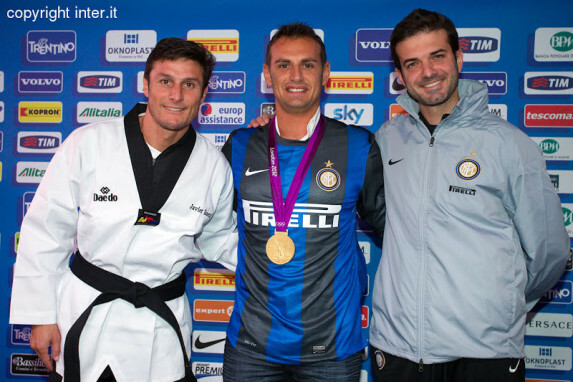 The Italian Olympic Champion, Carlo Molfetta, known as fan of Inter Milan, received from Javier Zanetti an autographed shirt and in return he gave him a WTF Taekwondo Dobok. Javier Zanetti, Carlo Molfetta and Andrea Stramaccioni. Carlo Molfetta will be in the “Giuseppe Meazza Stadium” to encourage the Inter that will play against Sampdoria, but first he stopped at Appiano and greet the players of the Football Club Internazionale Milano (known in Spanish as Inter of Milan). The Olympic champion in the 2012 London Olympics in the category +80 kg Taekwondo, is a Nerazzurri child fan and this past Tuesday October 30 his dream came true: he received a shirt signed from hands of Zanetti and in return he gave him a WTF Official Dobok. Molfetta has reached Appiano accompanied by the President of the Italian Federation of Taekwondo, Angelo Cito and greeted (besides Javier Zanetti) Diego Milito, Andrea Stramaccioni, Marco Branca and Ivan Cordoba. Diego Milito and Carlo Molfetta.